Formed in 1970 to preserve, maintain and register bridleways and byways. The Association continues to oppose any closure of riding rights of way and to initiate claims for bridleways and byways when these public rights are supported by either documentary or user evidence. 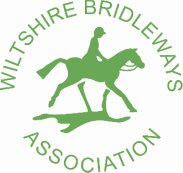 The Wiltshire Bridleways Association is entirely funded by supporters and led by a team of experienced volunteers. Working throughout Wiltshire, including the Borough of Swindon, acting in liaison with Wiltshire County Council, District Councils, Swindon Borough and Area Wardens over obstructions, diversions and planning matters which affect rights of way. It replies to consultation papers prepared nationally or locally and is involved in the development of special policies for rights of way along with the Wiltshire Countryside Access Forum. We would like to encourage riders in Wiltshire to join our association and support the work to maintain open bridleways and byways for future generations. Find more details on our supporters page. Throughout the year we organise events to fundraise for the cause; check out our What's On page for more details. Our supporters are vital eyes on the ground and we rely on you to report both good and not so good condition on the bridleways and by ways in your area. You can do that simply on line here.